Teenage Engineering has built a reputation for uncompromising hardware design, unconventional products, and a sense of simplicity and fun in everything they do — and its new OD-11 Cloud Speaker looks like it will do all of this in spades when it debuts this coming summer. Anders Halvarsson and David Möllerstedt from Teenage Engineering just gave us an exclusive early look at the hardware they'll be showing off at CES this week, and told us all about how the company's thoughts on the home audio experience shaped this unique entry into the high-end home audio market. The OD-11 has a host of highlight features — up to four speakers can be connected wirelessly, music can be streamed from cloud services without the need for a computer, and you can add beautiful analog wireless Bluetooth remote — but the most important characteristic to Teenage Engineering is the sound quality. "The best sound has already been invented," Möllerstedt says. "It's actually gone downhill for all sorts of other reasons like the move to portabilty, mobility, and everything else. Home audio has gone in the wrong direction." Halvarsson echoed that sentiment, saying that "if you go out today to buy something that lets you use all these wireless services and you want to have a good hi-fi system like you used to have, you can't find anything. You can find good services, but the hardware side is missing." The OD-11 looks to change that by utilizing a design first created by Swedish audio engineer Stig Carlsson. Unlike standard speakers which point straight at the listener, Carlsson's design has the speaker grilles on top, with a tweeter and woofer angled out so the music surrounds the listener regardless of where they're standing. It's externally similar, but has modern internals, including Wi-Fi, Bluetooth, a sound processor, a power supply and a 100W amplifier. In our brief experience listening to the OD-11, its sound quality absolutely surpassed most standard speakers on the market. Sound was loud and clear, with no distortion and a very balanced profile — bass was present but not overly loud, and highs were well-pronounced without being shrill. It's definitely meant for people who are serious about merging a high-quality home listening experience with the benefits of streaming music. "Why do something from scratch when there's this great thing we can take and refine... and re-engineer?" Teenage Engineering worked with the Stig Carlsson Foundation to update his speaker design for the 21st century — Möllerstedt noted that Teenage Engineering doesn't have experience building speakers, so it instead used one of the more iconic and time-tested designs. "Why do something from scratch when there's this great thing we can take and refine... and re-engineer?" asks Halvarsson. The other draw to Carlsson's design was the timeless industrial design — the company feels the minimal aesthetics match both its overall style and feels that it'll fit into any home without being overly obtrusive. The near-complete lack of buttons, displays, and dials is completely intentional (the speakers contain "emergency" volume and power buttons for if your remote isn't working). "You enjoy sound with your ears, rather than with your eyes," Halvarsson says. Making things as minimal as possible will hopefully let users concentrate on the music, not on any displays or controls. Even the remote was built with extreme care — it's an analog dial that you can click to start and stop music and skip tracks or twist to turn volume up and down. There's no display, and it uses Bluetooth 4.0 low power, so its battery should last two years without needing to be replaced. As per usual, it contains a number of thoughtful touches, including a magnet so that users can stick the remote to their fridge (or to the speaker itself). 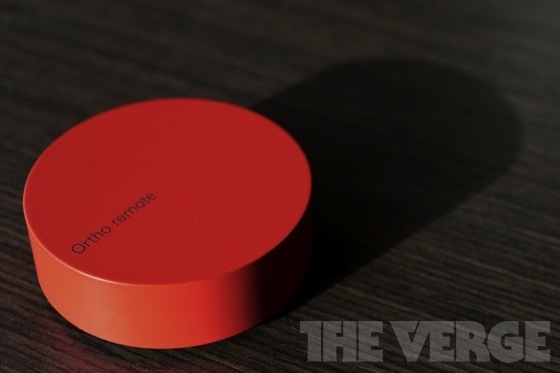 It also comes in different colors, so each family member can have their own remote — and that remote will be tied to that user's specific playlists, as well. "You enjoy sound with your ears, rather than with your eyes." Despite the extreme care given to the industrial design and audio quality, the real innovation in the OD-11 is how you get music onto it. While Teenage Engineering isn't ready to announce streaming music partners yet, the speaker use its built-in Wi-Fi to hook up to cloud services and pull down music — while it sounds like there will be some initial computer setup needed, the speakers can stream music directly without a computer. Once the software is finalized, multiple users will be able to add songs to the device in a Nexus Q-style social streaming setup, though it'll hopefully work with a variety of services (unlike the Nexus Q). The software is definitely still a work in progress, however. "We knew about electronics, but acoustic products were a completely unknown territory," says Möllerstedt . "We spent all of this year learning about acoustic design. Now, we're moving on to software." The speakers will also support standard local audio thanks to a built-in 3.5mm jack as well as an optical audio input. The OD-11 is definitely not for everyone — it'll cost $800 per speaker, with the Bluetooth remote also incurring an additional charge. That price means it'll be of interest to those interested in a serious, high-quality home music experience. Teenage Engineering is hoping its new product will extend that market, however. "There is so much new, great [music] technology, but it has kind of made the actual experience of listening to tracks disappear," says Möllerstedt. "We want to bring that back because it was fun when you just had a few vinyls and you flipped through them and shared them with your friends."